I have done numerous projects for Adat Israel and the Hebrew Academy over the years from their logos, brochures, various art work, renderings of building projects, etc. Adat Israel, Chabad of West Orange County commissioned this particular project which served as a successful fundraising effort for their new building addition. Due to the building restrictions and the nature of the construction they could not put in real windows, though they wanted to have the feel of light that a window gives. The theme of this is the 12 Tribes of Israel. These are named from the sons of Jacob who are Reuven, Shimon, Levi, Yehuda, Dan, Naftali, Gad, Asher, Issachar, Zevulun, Yosef and Benjamin who are the ancestors of the tribes. The images are from the symbols of the tribes and the colors from the stones and banners associated with each. The Hebrew name is above the symbol is an attached strip floating off the background cut out. At the very top of each is the blessing bestowed unto the sons. These “windows” are 3’ x 12’ and the idea was to not make them as imitations of stained glass windows, yet still have the play of light through different colors being an integral part of the design. I determined that each element should be at different levels. They are made in distinct, separate layers consisting of the background cut in the shape of an arch, an arch cut from Plexiglas and painted, the symbol of the tribe. The base layer panel is a painted gradient in the flag color of the particular tribe. 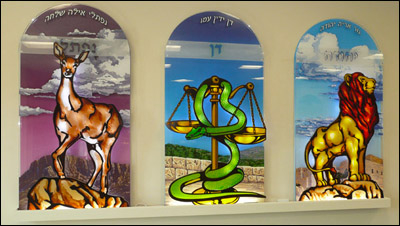 The Plexiglass arch consists of clouds painted on the back and a landscape depicting the landscape area of the particular tribe, in the appropriate colors. I wanted each to have a strong central graphic element which was the symbol of the tribe depicted. These I created with cut 1/2” thick cut plexiglass shape painted with transparent paint and sandwiched together with a more detailed cut out of aluminum. The aluminum I painted with a transparent candy coat of root beer to give a interesting sheen when viewed from different angles. All of these elements were cut from line drawings I made, scanned, and then turned over to Joel at Aquatech Waterjet, who proved extremely helpful in this and other phases of the overall redevelopment project. They were hung according to the best approximation to the location of the tribe and then lit with a combination of T-2 fluorescents and LEDs providing for a very low energy consumption. The names of the donor and the dedications were hung below each.